We have heard the chants for three years, “Build the Wall!” It was the number one reason why Americans elected Donald Trump as President in 2016. Unfortunately, it is the most glaring unfulfilled promise of the Trump presidency. Although the President wants a border wall, he needs Congress to fund the construction. Until now, Congress has only provided an anemic $1.6 billion for the border wall. This pathetic amount is nowhere near the $25 billion that is actually needed to properly build a wall that will stop the influx of illegal aliens. Right now, Congress is in the final days of a lame duck session. It is imperative that Republicans stand firm to demand the entire $25 billion for the wall. If it is not authorized now, it will never be funded. Starting January 3rd, Democrats take control of the House and Speaker Nancy Pelosi has no interest in securing the border and is especially opposed to funding a wall. In fact, Democrats want an open border as they benefit politically from the mass flood of illegal aliens. As more people start receiving government benefits, these individuals become indebted to the Democratic Party, which is the guarantor of massive federal bureaucracies. Also, the vast majority of these illegal aliens who become voters will support the Democratic Party. For example, in recent presidential elections, approximately 75% of Hispanic-Americans voted for Democratic candidates. The results are clear to see throughout the western states of the nation. Democrats have turned California, New Mexico, Nevada and Arizona into blue states in recent years. All of these states were once Republican strongholds, but as the arrival of both legal and illegal immigrants has changed the demographics of the states, it has also changed the political affiliation. The Democrats next target is the big prize, the Lone Star state of Texas. If they can turn that big red state blue it will be game over for the Republican Party. Without the 38 electoral votes of Texas, the GOP will no longer be able to win the presidency and the Democrats will have a lock on the White House. So, the stakes for the Republican Party are extremely high. Every Republican in Congress should be supporting a border wall to stop the enormous flow of illegal aliens into the country. Unfortunately, the party is saddled with establishment leaders like House Speaker Paul Ryan who have no interest in building a border wall or enhancing border security in a meaningful way. The President must overcome Ryan’s lack of support and use his negotiating skills to achieve adequate border wall funding. While the military is building temporary barbed wire fencing in some areas to stop the incoming caravan invasion, it is nowhere near as effective as a permanent wall. If the President has to shut down the government to get the necessary funding, he should do it without hesitation. In a recent Politico interview, the President said he would be “willing” to shut down the government if at least $5 billion for wall funding was not included in the budget for the Department of Homeland Security. In fact, the President said he was “firm” on the issue. Let’s hope he does not backtrack on this vital issue. Currently, this is the most severe threat facing the nation. In October 2018, illegal border crossings soared according to U.S. Customs and Border Protection. In their Southwest Border Migration Report, it was revealed that almost 51,000 illegal aliens were apprehended at various locations on the southern border between ports of entry. This was the highest number of apprehensions since 2007, showing the increasing nature of the threat. If action is not taken, Princeton University researcher Steven Kopits estimates that the overall number of border crossings next year will exceed 600,000, the largest number in over a decade. With caravans of thousands of migrants either at the border or moving in that direction, the country cannot afford to delay the essential funding for the border wall. The entry of huge numbers of illegal aliens will not only change the political map, but it will also lead to more crime as the Department of Homeland Security estimates that there are at least 600 criminals among the caravan of migrants. There is also a real threat to the health of Americans. A recent Fox News report quoted a health official in Tijuana estimating that over one-third of the migrants in that city were ill, with diseases such as hepatitis, tuberculosis, AIDS, chickenpox and severe respiratory conditions. These threats should force the Congress to finally fund adequate border security, including the construction of a wall. It is now or never for congressional Republicans to act. Otherwise, the consequences will be dire for both the GOP and, more importantly, for the nation. 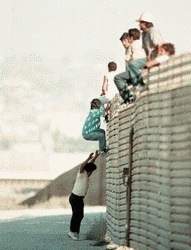 Posted in Freedoms and tagged Border, Illegal Immigration, United States.